I'm currently researching new equipment to upgrade our 5 year old church video recording hardware, and because we currently don't have our own permanent house of worship building, there is a need for a compact mobile church video production unit that we can use for recording our sunday morning church live in High Definition. So far the options I have looked at include Sony's Anycast solutions, NewTek's tricaster 'broadcast truck in a rucksack' PC based live production unit, but the one that seems to have fitted the scope the most is Datavideo's HS-1000 Mobile recording Studio. The HS 1000 is a very portable live HD video production unit based around a 6 channel HD/SD video switcher, which can be made operational within minutes of unpacking it (you still need to run the cables that will connect the cameras to mixer unit), ideal for churches that don't have their own permanent buildings. 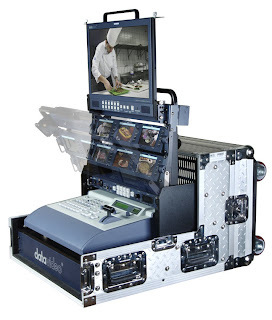 In addition to the mixer, it has 6 preview video monitors, a 17 inch program screen, 6 channel full duplex talkback intercom system with camera tally lights for video director to camera crew communications, full cable loom and connections, all fitted into a secure flight case that can be wheeled about by a single individual. With the option of a HDV/DV data recorder that can be added this looks like an idea solution for our church needs, and would enable us to produce high quality HD programming with the post production time no cut down because I would not have to wait 1-2 hours to capture the recorded service unto our Apple Mac for editing in Final Cut. I'm just going to check a few other HD live mobile recording setups, review some suitable cameras, and then put a proposal together, and hopefully we can get the budget approval for the new video equipment for our department. New cheap HD video switcher/mixer.